Kidnap kingpin, Chukwudumeme Onwuamadike, a.k.a. 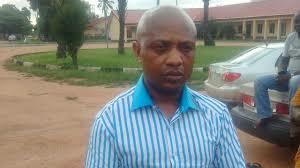 Evans lawyer, Mr. Olukoya Ogungbeje has petitioned the Police Service Commission, calling for the probe of the policemen who handled the case of his client, Owojela’s Blog reports. Ogungbeje, in a petition dated October 13, 2017, alleged that members of the Inspector-General of Police Intelligence Response Team, which handled the case, abused their position to extort his client. According to him, the team of police investigators, led by Mr. Abba Kyari, an Assistant Commissioner of Police, “forcefully and corruptly extorted” from Evans cash in local and foreign currency as well as various items including phones, wrist watches, jewellery, television, cars and trucks. Ogungbeje claimed that the policemen forcefully took N50m from Evans, while his wife was also forced to part with another N5m. The lawyer claimed that a sum of $10,000, was also forcefully taken from the suspect by the police. Other items allegedly taken from Evans by the police, according to Ogungbeje, are a Brigade wrist watch, valued at $117; a pendant cross, worth $70,000; a necklace, worth $25,000; a Virtu phone, worth $30,000; a Virtu Signature phone, valued at $17,000; and five pieces of Saphono Ruccu diamond rings worth $100,000. Ogungbeje also claimed that the policemen also removed and took away the 85 inches Samsung television set, worth N6.5m in Evans’ apartment. Other items were 25 Mark trucks; a Lexus 470 jeep; a Grand Cherokee jeep; a L400 Mitsubishi Bus and a gold-colour Toyota Highlander jeep. The petition, captioned, “The Evans case and saga: Brazen extortion, corruption, gross misconduct, sexual molestation, and human rights violation against the IGP Intelligence Response Team police officer and policemen,” demanded the probe, sanction and possible dismissal of the accused policemen. Ogungbeje said in the petition addressed to the Chairman of the Police Service Commission that, “It is very unfortunate that the above-named police officers and policemen could be involved in such gross misconduct and indiscipline in taking advantage of a criminal suspect in their custody to perpetrate high-level extortion, corruption, gross misconduct, indiscipline and sexual molestation. “From the foregoing, we urge you, sir, to constitute a special investigation and enquiry panel to investigate this monumental extortion, corruption, gross misconduct, indiscipline, sexual abuse and Human rights violation against all the police officers and policemen of the Inspector General of Police Intelligence Response Team.